I loaded up on Italian plums at the farmers market last weekend. Their sign said “last of the season” and I sighed because we’ve moved so quickly into the autumn months. It was a game day and all the college students have arrived back in town. These past few days, the temperature still got uncharacteristically up into the ’90s ’round these parts, but the mornings and evenings say summer has ended. It’s dark until 7:00 am. It gets dark at 7:00pm. Blink and those last few plums will be missed. The remaining local peaches sold out early at the market a week ago and the melons are on their final hurrah. Well and truly, though I’m reluctant to transition at this time every year, I’m a sucker for each new seaon. There are new-again flavors to be savored and weather and beauty in the natural world to be appreciated. Fall is my MOST FAVORITE of all because of the crisp mornings, colorful leaves, and the natural bent of light that slants just so each afternoon. Plus, I like comfy sweaters, hugging my cuppa throughout the day, the return of the rain, and warming spices that mean more in this season than all the others. 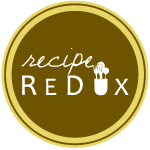 The Recipe Redux folks requested a recipe this month with dehydrated food. I don’t have the equipment or the space these days to go all DIY and and get my dehydration-station on, but I do have grandparents that have stocked my parents’ freezer with no small shortfall of prunes. My mom never uses them. I’m the only one who ever takes a random bag home, and even then, I’ve only developed one recipe over the years that I really like to eat prunes in. No longer. They go well with hazelnuts, chocolate, and spices. Plus, they can be enjoyed all season long, since you know, they’re dehydrated and all. 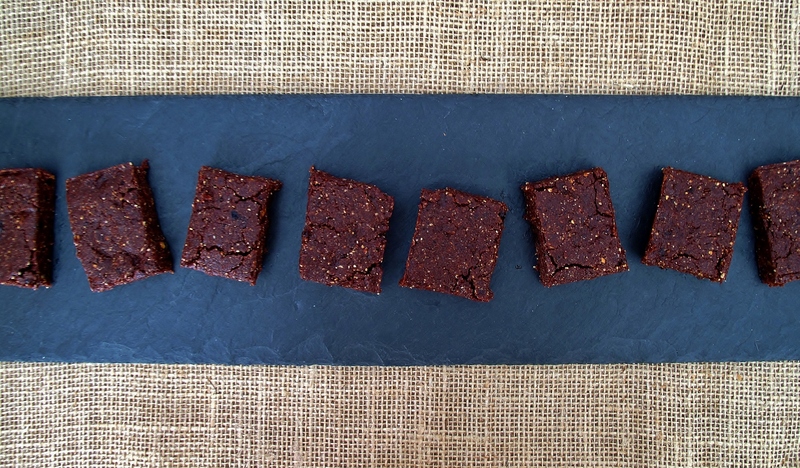 This brownie really is lovely and boasts a huge plus: it’s nutrient-dense. 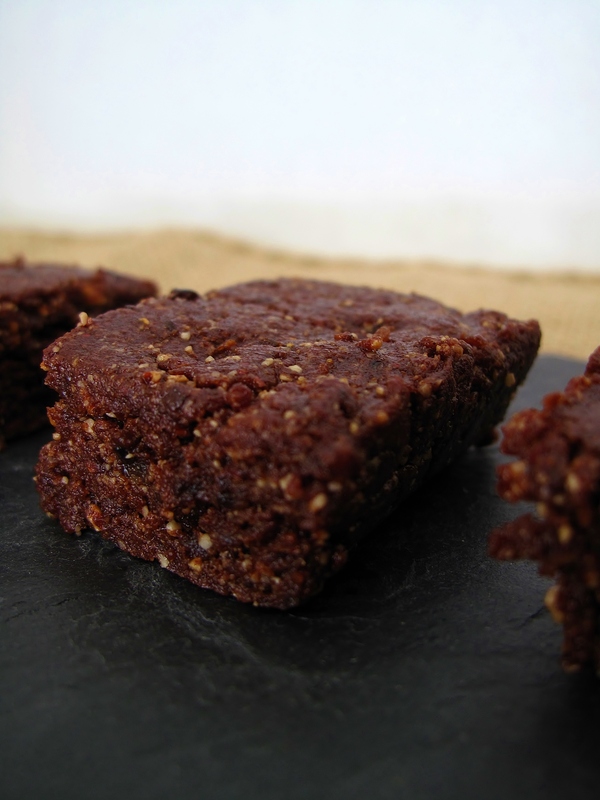 I know all my friends and relatives roll their eyes because I make desserts that always have some form of health benefit, but raw desserts are simply the best. 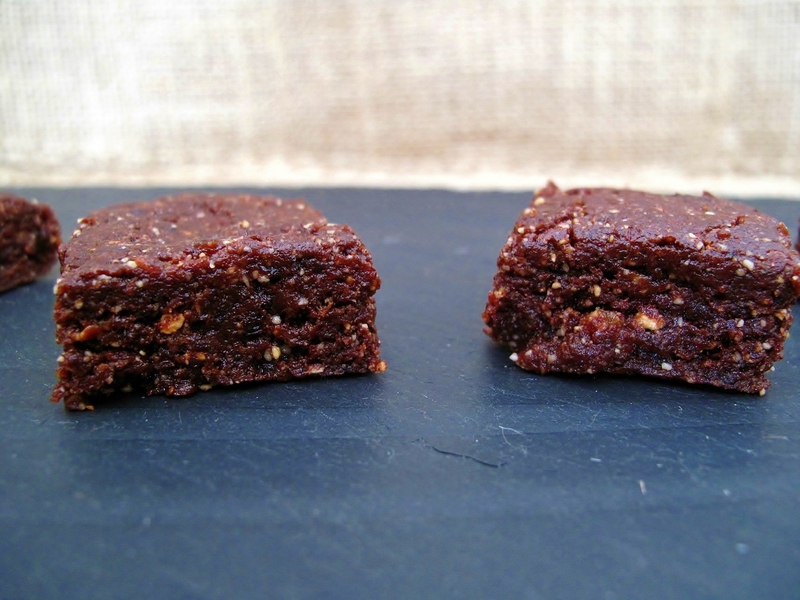 These brownies have all the good flavors, natural sugars from the fruit, and are packed with antioxidants, vitamins, minerals, and healthy fats from the raw cacao and hazelnuts. In a food processor, blend the nuts, cacao powder, salt, and spices until they are all finely chopped and incorporated. Next, toss in the dates (pitted and halved), and the prunes. Process until a paste begins to form, and add 1-2 Tbs. water until the mixture just begins to form a dough, but isn’t too sticky. 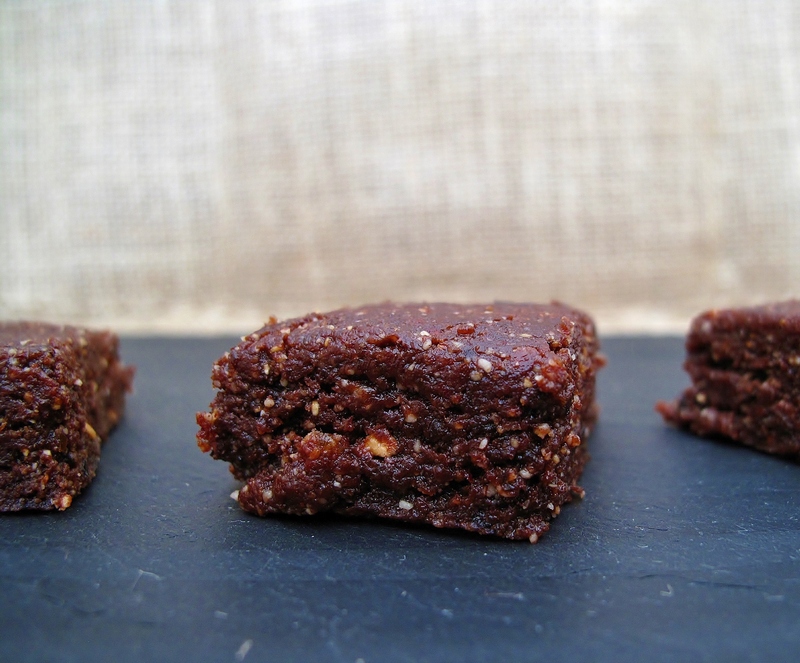 Line a 8×8 pan with parchment paper, and scoop the brownies in. Flatten them across the whole pan, and then stick in the freezer to harden up for about 30 minutes. They can then be removed and cut into square. If you’re not going to serve and eat them all right away, store them in the fridge or freezer in a covered container. This batch makes about 16 brownies. 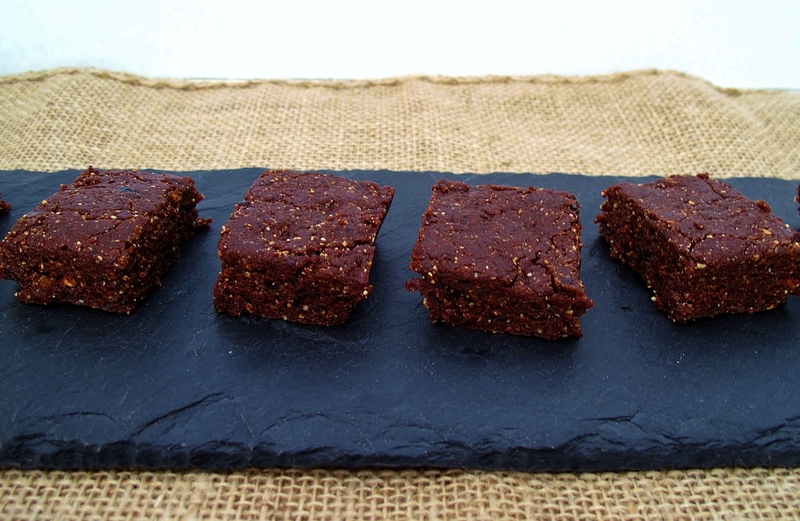 Dates and prunes together sound delicious!